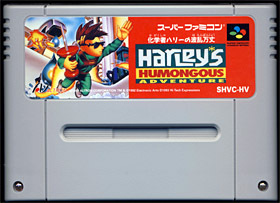 Kagakusha Harley no Haran Banjyō (aka Harley's Humongous Adventure in the rest of the world) is a side-scrolling platform game by Visual Concepts. The young Harley, a brilliant scientist in a green suit and black shades, is busy working on a revolutionary shrinking machine when disaster strikes. The device explodes in a bang and its pieces get scattered all over the place. Getting them back would be an easy task if only Harley hadn't shrunk to the size of a mouse. He now must retrieve all the lost pieces and reassemble the precious machine in order to get back to his old self. Our tiny hero can use a large library of weapons that he collects along the way - nails, marbles, tacks, rubber bands and so forth. They however all come in limited quantities and our miniaturized scientist must always make sure that he doesn't run out of ammo. He also comes with a jet-pack and a limited amount of fuel. The device can be used in many occasion to reach high platforms or fly over hazards and googly-eyed ticks. Areas are varied and later stages get Harley to drive a toy tank or swim at the bottom of a maze-like sink. 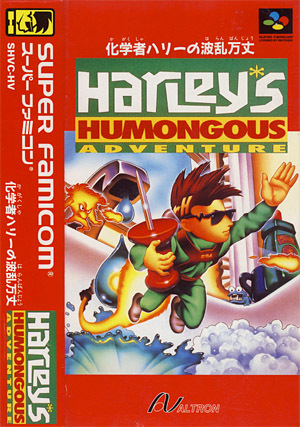 Harley's Humongous Adventure reminds me of "Honey, I shrunk the kids" without the fun and excitement of Joe Johnston's flick. Where do I start ?... The game started out with good intentions and features a couple of nice ideas, but it soon falls into complete chaos and nonsense. I can hear the marketing people saying "this is just a game for kids guys, they'll eat it up - btw, can Harley wear shades so he looks cool ?". The game is flawed like so many western platform games with sluggish controls and play mechanics, tasteless level design and a relatively unpolished universe. Harley's Humongous Adventure failed to convince me that I should do anything to help Harley in his journey. Thinking about it, the game doesn't even seem to care about the player and nothing really motivated me to go ahead. I gave it two stars because of some of the "nice" ideas thrown here and there (such as the tank toy you drive at some point) - but don't get me wrong, this game is definitely a less than average title without much on display.